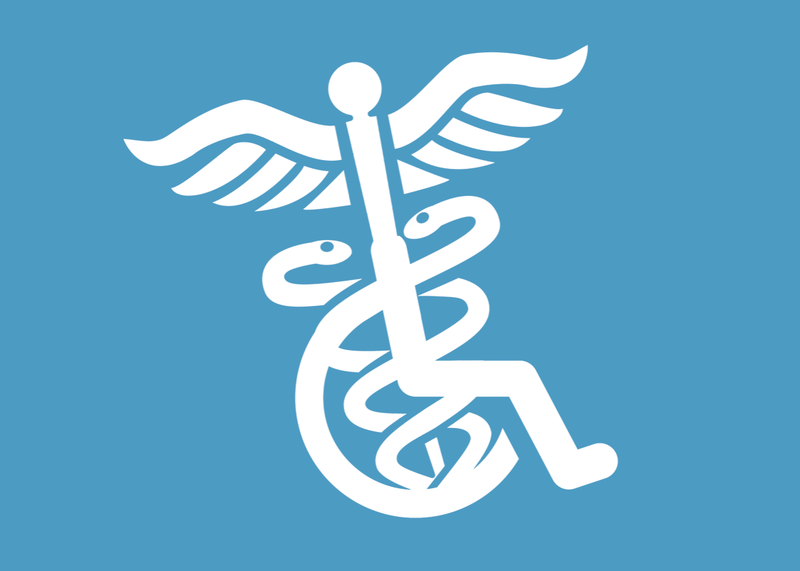 Increasing the number of doctors with disabilities would improve health care. One-fifth of all Americans have a disability, but less than 1 percent of doctors do. That’s slowly starting to change—to the benefit of medicine and patients. Photo illustration by Slate. Images via rashadashurov, oculo/iStock. When Dr. Bliss Temple was in training, she remembers being in an elevator wearing her white coat and her stethoscope when a patient who was using a wheelchair got in. Temple is paraplegic; she also uses a wheelchair. More than 56 million Americans have a disability of some kind—nearly a fifth of the country. Yet a vanishingly small percentage of doctors have a disability of any kind—estimates vary and data is scant, but the consensus suggests that the number is somewhere around 1 percent. The problem starts at the tip of the pipeline: People with disabilities make up somewhere between 0.3 and 2.7 percent of medical school classes—estimates vary, but even at the high end, this makes them one of the most underrepresented groups in American higher education. The divide is stark, and the consequences can be severe. Americans with disabilities are more likely to be sick but less likely to get adequate health care. This is partially because having a disability increases the likelihood of being poor or being unable to access care. But it has also created a system in which vulnerable patients feel their doctors misunderstand their bodies and their lives. Colleagues sometimes tell Temple that they don’t think of her as a person with a disability, even though she’s spent her career at San Francisco General Hospital working on health care access and social justice for people with disabilities, including stints at the World Health Organization and consulting for the Department of Health and Human Services. She’s no stranger to the stereotype that doctors don’t have disabilities. Doctors take care of us in our most critical moments, when their ability to do their jobs can make a mortal difference. We want doctors who look like they can rush us to the intensive care unit like it’s 45 minutes through an episode of a medical drama. But in recent years, disability activists and policy experts have argued—persuasively, according to many court cases—that disability does not prevent medical students from learning how to provide excellent medical care, particularly when they can receive assistance from increasingly adept technical tools. Not only is denying their right to train as doctors illegal; it inadvertently denies the many Americans with disabilities the benefit of having more medical professionals who understand them. The struggle for representation in medicine starts with who gets to go to medical school in the first place. For most aspiring doctors, medical school admission is merely a matter of excelling at coursework, research, volunteering, the Medical College Admission Test, personal essays, and interviews. Even then it’s tough going—most medical schools have admission rates in the low single digits. But students with disabilities have an additional obstacle after they’ve been admitted: They must prove to the school’s administrators that they can meet the physical requirements of medical education. These expectations, codified into “technical standards,” are often broken down into five essential functions: observation, communication, motor function, conceptual and quantitative analysis, and social skills. The exact standards vary by school and curriculum. For example, MD candidates at one school may have to personally deliver 10 babies to pass an obstetrics rotation while candidates at another only have to assist. This idiosyncrasy wouldn’t matter to most applicants, but it can disqualify someone with limited arm mobility, no matter how dazzling their application. After getting in on the strength of their grades, scores, and essays, students can find themselves caught between forfeiting their admission and signing a document pledging they can perform medical procedures with accommodations that they don’t know for sure that they’ll receive. Perhaps unsurprisingly, this federal law compelled only a modest increase in the number of students with disabilities graduating from medical school. In 1979, six years after the Rehabilitation Act’s passage, the Association of American Medical Colleges, or AAMC, published a technical standards template to guide medical schools as they began to read applications they could have quickly rejected a few years earlier. After the ADA was passed, many medical schools complied with the law by simply copying the AAMC’s 1979 guide near-verbatim and haven’t changed them much since. At the time, the AAMC seemed more concerned about preventing lawsuits than inclusion. “In the admissions process, the burden of proof is on the applicant to demonstrate that he/she can meet the essential 5 functions of the program,” an AAMC memo from 1993 read. “How much accommodation may be too much is a matter which will be tested in the courts. The safety of patients involved in student education is of paramount importance.” To this day, many schools leave the burden on aspiring physicians with disabilities. In 1996, six years after the ADA was passed, Case Western Reserve Medical School rejected a blind student based on her inability to meet their technical standards without an intermediary, and when the student sued, the Ohio Supreme Court upheld the decision. Courts no longer show medical institutions so much deference. In 2014, the Iowa Supreme Court ruled 5–2 that a blind student at Palmer College of Chiropractic was entitled to accommodations when reading X-rays. The majority reasoned that a fifth of chiropractors rely on radiologists to make and read X-rays, and so the school violated the ADA by not considering alternative ways its student could make a diagnosis without seeing the X-ray himself. In 2013, the 8th U.S. Circuit Court of Appeals ordered Creighton University School of Medicine to pay for the accommodations of Michael Argenyi, a deaf student who over his first two years of medical school spent more than $100,000 on an audio-dictation apparatus that translated his classes in real-time. Creighton said the translator, which cost $50–60k a year, was an undue burden. The court disagreed. Advances in technology are gradually expanding the pipeline for applicants with disabilities, both creating new means of accommodation and making accommodations that were once too clunky or expensive easier and cheaper. Blind students can use devices that represent flat images with vibrating pins to read histories and electrocardiograms. On their surgery and anesthesiology rotations, deaf students can take in the back and forth of the operating room through a screen of transcribed dialogue. Meanwhile, some medical schools are starting to reconsider the need for strict and expansive technical standards that apply to all doctors equally. The move has as much to do with disability accommodation as with practicality. Though medical students face pressure to perform on all of their rotations, and benefit from exposure to different specialties, they ultimately choose one specialty for their residency and their career. While most medical schools still expect their graduates to be “undifferentiated”—as able to become oncologists as surgeons—some schools are gradually, if not formally, bending their enforcement of technical standards, allowing, say, a student with limited arm function to get a foundation in surgery before going on to become an excellent oncologist. Contrary to the stereotype that they only become family doctors or psychiatrists, doctors with disabilities practice in all specialties of medicine. “If you look at Michigan’s technical standards, I probably wouldn’t meet them,” said Molly Fausone, a third-year medical student at the University of Michigan who is paralyzed from the chest down. When she was applying to medical school, she said that she reached out to other students and doctors with disabilities—including Temple—to understand how their medical schools had accommodated them. When a quadriplegic student at Johns Hopkins University told her about his frustration with the school, she decided not to apply. Even after Fausone got into half a dozen schools, two withdrew her acceptance because they decided she didn’t meet their technical standards. Fausone also worried about how she’d be treated at the remaining schools. She decided to call the dean of Michigan’s medical school to get a straight answer on how the school would accommodate her as a student. After a conversation about Fausone’s strengths and goals—she plans on practicing internal medicine—the dean told her how UMMS would help her get her education. The school was planning to rewrite their technical standards, anyway. Michigan’s decision came in response to research conducted by doctors on its faculty. Philip Zazove and Michael McKee, both family medicine physicians and both deaf, have written and researched extensively about the intersection of disability and medicine. In November 2016, they co-wrote a paper with Fausone (and others) addressing common concerns about medical students with disabilities. They wrote that worries about patient risk overestimating the responsibility of medical students—who are rarely left singularly responsible for a patient—and underestimate the capacity of people with disabilities, who have spent their entire lives communicating about and adapting to different environments. The concern wasn’t supported by data, the paper argued. “Not a single legal case known to the authors has been filed in which patient harm resulted from an accommodation provided to [a student with disabilities. ]” They concluded that schools should adopt technical standards that focus on results rather than methods. The research also argued that doctors with disabilities will not only not be a risk to patients but could make it easier for patients with disabilities to receive adequate health care. Medical schools considering such revisions often look to Dr. Lisa Meeks, a disability expert and consultant at University of California, San Francisco, for advice. Meeks says schools are increasingly aware of their need to accommodate students. In her policy work and research, she’s spoken with hundreds of physicians and medical students with disabilities about their experience in medicine and translates their stories and her data into policy recommendations that are salient to medical school administrators. Meeks is working with the AAMC on a report about disability inclusion in medicine due out in September. The report will include recommendations on ways that American medical schools can be more inclusive to students with disabilities, including revisions to technical standards that could make them clearer, more flexible, and more explicit about accommodations. To Meeks, the report signals that authorities in medical education are beginning to take disability inclusion seriously. She further noted that all of the AAMC’s top executives have been enthusiastic and supportive; every member read a preliminary draft and gave feedback. While the report’s recommendations are not mandatory, the AAMC has enormous influence over the small world of medical education. Meeks, who said she gets five to six calls from medical school administrators a week, also helps individual schools improve their disability policies to become more accommodating. When administrators justify their policies by stating that they can’t admit anyone who can’t do CPR, Meeks has a ready response. “I say, ‘OK, but that could be a dynamic but petite female student with limited upper body strength or a student who uses a wheelchair with limited upper body strength.’ The standard has to be consistent.” She recommends schools require students to be able to perform or direct CPR. Meeks said that exclusion is less often a matter of prejudice than it is of medical schools not knowing what they don’t know. “I wouldn’t have a consulting firm if they didn’t want to do the right thing,” she said. There is no data to suggest that including more doctors with disabilities would meaningfully increase medical error or harm to patients. But many advocates believe that it could help provide better health care to patients, particularly patients with disabilities, by bringing greater awareness to the challenges they face. Temple told me that the first time she got a pelvic exam, the doctor’s office did not have an adjustable exam table. He performed the examination on the hallway floor. He also skipped parts. “He didn’t ask the second half of medical examination form about fertility or sexual activity,” she said. She was 18 years old. When doctors’ offices don’t accommodate patients properly, they could miss out on critical health care—particularly on checkups or preventative services that could help keep them healthy. Patients aren’t as likely to get prevention services when the doctor’s office doesn’t have an adjustable table, and—less tangible than an exam table—patients might be less likely to go in for checkups if they’re frustrated with their care. Many medical schools have sensitivity trainings on the ways race, class, gender, and sexuality can affect clinical practice, but disability training tends to be optional and self-directed if it happens at all. The result is a shortage in physicians who can effectively and respectfully provide care for a fifth of the country, which accounts for $500 billion in health care spending. Having more medical students and doctors with disabilities could start to reduce disability-related health disparities. Rather than detract from the education of their classmates, medical students with disabilities would provide a constant education about what living with a disability is like to their peers. Increased representation on medical school campuses might also encourage administrators to take disability training for all doctors more seriously. Second, an extensive 2004 report from the Institute of Medicine found that greater inclusion of racial and ethnic minority groups in medicine was associated with lower barriers to care for minority groups, as well as “increased patient satisfaction and choice.” It also suggested that their presence on campus provided ambient cultural sensitivity training to their peers. A study in 2013 that Zazove co-authored found evidence of a similar phenomenon among deaf doctors. As with so many things, representation is the first step. “Doctors are healers, but they’re also arbiters of what’s normal,” said Temple. They tell us whether our worries are worth the worry. They help us grapple with the fragility of our bodies, the contingency of our lives. We see and hear and walk, but we won’t always. As we age, we are more and more likely to gain a disability—nearly three-quarters of adults over 80 live with one. Doctors with disabilities are not only able to heal us in the same ways as any other doctor; they may be able to help us better understand our bodies and how to live in them.